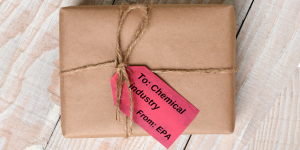 Earlier this week, the New York Times reported on the withdrawal of the nomination of Michael Dourson to head the Environmental Protection Agency’s (EPA) chemical safety office – which we applauded as a win for public health. The Times article mentioned and provided a link to a 400-page trove of emails to and from Dourson that were obtained through a FOIA request filed in August by Greenpeace to the University of Cincinnati, where Dourson previously worked. The emails shine a rare spotlight on a network, of which Dourson and the American Chemistry Council (ACC) are a part, that operates largely out of public view. It involves a coordinated effort between the chemical industry and its private and academic consultants to generate science that invariably supports the safety of the industry’s chemicals, and pushes back against any regulatory and academic science that indicates otherwise. The emails make for very interesting reading, if you can skip through the myriad emails about scheduling calls and meetings (which make up the bulk of any of our inboxes, I suspect). Our last blog post was quite lengthy and some readers may not have gotten to the recommendations we provided to EPA’s Integrated Risk Information System (IRIS) governing disclosures of conflicts of interest. In that post, we also cited the numerous strong precedents for requiring such disclosures. Simultaneously pursuing these lofty goals of increasing throughput, scientific quality, transparency and stakeholder engagement in IRIS assessments is challenging, to say the least. EDF has and will continue to emphasize the need to strike a balance between these goals, given that overemphasis on one can actually exacerbate the problems aimed to be addressed by another.